Shunning dark and violent sagas like Shutter Island, The Departed and Taxi Driver, films that have brought him commercial success and solid reviews over the last three decades, Martin Scorsese has scored a huge triumph with the exuberant, eye-poppingly sensuous and emotionally stirring Hugo, his first family film and his first in 3D. The director, who is approaching 70, said that he was inspired to make the film by his 12-year-old daughter Francesca, who introduced him to the Brian Selznick's novel The Invention of Hugo Cabret, a few years ago. He has also said that Hugo is more than a children's film. Come the awards season, it could be up for a huge haul of nominations, not only in the technical departments, but also for best picture and director. Set in Paris, Hugo is not only a story about the wonderments of childhood, but is also a tribute to old world cinema (like another splendid Oscar worthy film, The Artist). The story follows the young orphan Hugo (Asa Butterfield) who lives in a 1930s Paris railway station, his battles with the mean spirited station inspector (Sacha Baron Cohen) and his friendship with a girl (Chloe Grace Moretz) also living in the station and being raised by the film pioneer Georges Melies (Ben Kingsley) who has fallen on bad days. While the film has excellent performances, especially by Kingsley, what thrills most is the awesome and imaginative world Scorsese has created. In real life, Georges Melies, who pioneered special effects in the first quarter of the 20th century and made films such as A Trip to the Moon, spent a few years running a toyshop in a Paris train station after his film studio was forced out of business by the ascendancy of Hollywood and a handful of French studios. Other filmmakers helped him to start a new business but it was nothing compared to the studio and its creative output. Hugo moves at a leisurely pace but you are so engrossed in its emotions and visual splendours, you may not want to complain about its pace and may not even find it -- at two hours and 10 minutes -- a bit long. In the strong competition for the box office dollar during the lucrative Thanksgiving weekend, Hugo came third among the new family releases, but it was playing in just 1,200 theatres, while The Muppets and Arthur Christmas were each in more than 3,600 theatres across North America. Even so, Hugo grossed $15.4 million in five days while The Muppets took a resounding $42 million and Arthur Christmas, a disappointing $17 million. The Muppets, which stars and was co-written by Jason Segel, performed far better than previous feature films such as The Muppets from Space featuring Miss Piggy and Kermit the Frog, in the last decade. The film is hot in India and Mexico and will be playing worldwide soon. Arthur Christmas is the story of how Santa's son steps in to save the situation for his father when the machinery fails and thousands of letters are to be delivered to the children through some other means. Though not as glowing as reviews of Hugo, The Muppets and Arthur Christmas have also got plenty of praise. Box-office analysts expect Arthur Christmas to do far better business in the coming weeks across the globe as Christmas is approaching. Analysts also believe Hugo, which is yet to open abroad, will grow in box office stature in North America. It is expected to be shown in more theatres in America and Canada in the next two weeks and could be playing in some 3,200 theatres. It is expected to be a solid hit abroad where 3D films are more popular than in America. It may thus stand a good chance of recuperating its production cost and about $100 million on prints and advertising. It surely can come nowhere near the mass appeal Twilight, which in its second weekend grossed over $80 million worldwide and is heading for a glorious $800 million (conservatively speaking). 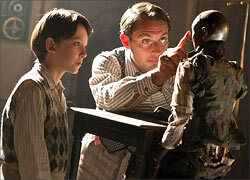 Hugo has some memorable scenes like the one in which the young boy attempts to restore a broken automaton passed on to him by his father, in the hope that it will bring a message from his dead father.